For overhead access and maintenance with safety. Complies with HSE PM28 standard. Safety mechanism locks platform behind the forklift heel. Slip-resistant floors with drainage holes. Kick plate around base - prevents tools from falling off. Fork box size: 75 x 180mm. Minimum truck rating 1000kg @ 600mm centres. High visibility yellow paint finish. Overall L x W x H: 1000 x 1000 x 2100 mm. Fitted with louvre panel to accept plastic storage containers (available separately). To access areas at great height to either remove products from shelving or for maintenance work, health and safety must be kept in mind at all times. Our economy safety access platforms work with forklift trucks to give employees safe access to above-ground areas. The boxes provide a level and comfortable standing area for over-head jobs, with a kick plate around the base to prevent tools from falling off and an anchorage safety harness to keep the user secure, helping to avoid the most common work place accident, falling from height. Designed and manufactured to conform to Health & Safety guidance note PM28 and GN48 standards, they have a maximum load capacity of 400kg and can hold up to 2 people. To prevent incidents involving liquid from affecting a day's work, the boxes have slip-resistant floors with drainage holes, allowing the user to continue on with their jobs confidently. 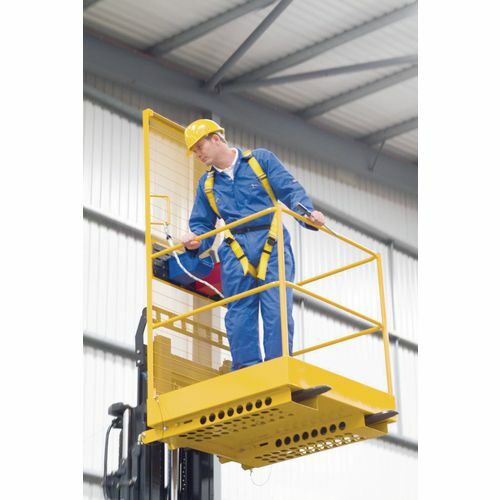 Our economy safety access platforms are useful and safe pieces of equipment; they have a high visibility yellow paint finish and benefit from a 12 month guarantee and FREE UK Delivery.